Difficulty in shifting is due to violations of the clearance mechanism of linkage, or due to wear of clutch release bearingand. And if in the first case, the repair is to ensure that the required check and adjust these parameters, in the second case, it is necessary to remove the transaxle from the vehicle. - a set of plumbing tools. 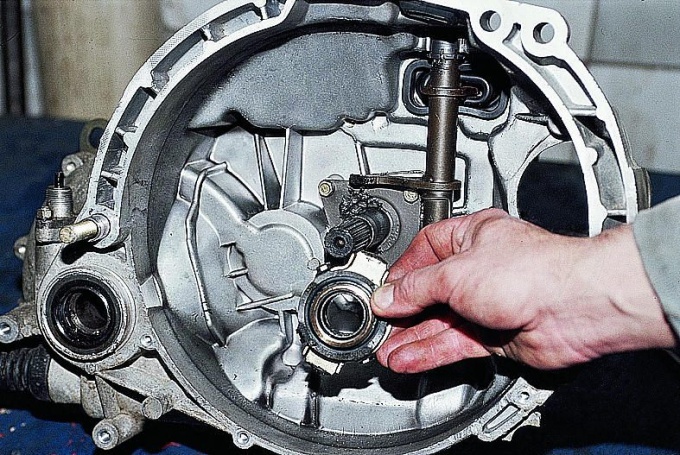 The appearance of extraneous noise from the bottom of the car at the moment of deenergizing of clutch with the engine running, a clear indication that the box changes gears, it is necessary to dismantle and find out the technical condition of the clutch mechanism along with its drive. All of these items are dismantled from the machine. Is extracted also and gearbox, input shaft which is located the release bearing, retained by spring retainer fork clutch release, which is picked out with a ball joint. Released from fastening the bearing removed from the shaft together with the clutch release coupling, part of a single whole with it. After you install the new bearing into the workplace, it is fixed there clutch release fork, the ends of which are entered in engagement with a spring on the clutch. All further actions on the Assembly of cars is carried out in reverse order.